Excuse the poor quality copy of a newspaper photo. Unfortunately nothing more seems to have come of this article and photo, however I believe it to be real and excellent evidential proof. The paper it was taken from is called "The World Weekly News" Make your own mind up. 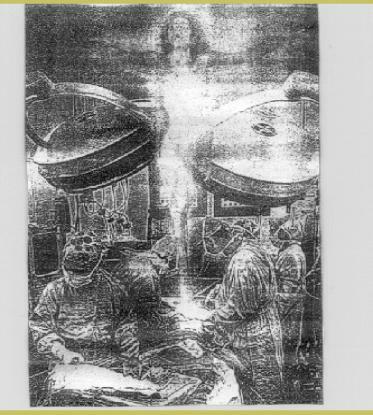 **** News Paper Article: Early 1990's **** First Photo of the Human Soul A surgical operation with complications, a dead patient, and a mysterious photo which offers a surprising take on what happened in the operating room. An extraordinary event has revolutionized the medical and scientific world, once again raising the possibility of life after death. It all began with a surgery at a hospital in Frankfurt, Germany. The patient died on the operating table, but a most unusual thing happened a couple of days later when one of the photos taken during the operation revealed the existence of the woman’s spirit. All this has caught investigators and skeptics by surprise, since the photo is real and many have had a chance to see it. A Risk-Free Operation When Karin Fischer, a 32 year old German housewife, was admitted to the hospital in Frankfurt for her operation, the commotion and the consequences of her trip to the operating room were the furthest things from her mind. In fact, she had no idea that these were the final moments of her life. The scheduled operation, while not a simple one, was not a high risk surgery; they were going to repair some defective heart valves. But something went wrong, and a series of complications caused her heart to stop beating only forty five minutes into the operation. Her death was signaled by the straight line running across the screen of the heart monitor. Not one of the twelve people on the operating room team saw what the photograph later revealed. The Surprising Photo At the moment of her death, Karin was surrounded by twelve people, all of them members of the cardiology operating team: all attempts by the doctors, technicians, and nurses to revive her were ineffective. Professor Peter Valentín, director of the Department of Teaching and Publication, was in the operating room at the time, taking photographs of the procedure. Surgeons are often filmed during operations; these photographs are used not only by scientific publications and medical archives, but also by medical faculty in their university courses. It was Professor Valentín who could not contain his surprise a few days later when he picked up the roll of film from the lab and saw the copies. One of the pictures clearly showed a diffuse and transparent human shape rising toward the ceiling with its arms open. It was a photo of a spirit leaving the body of the dead woman! Pope John Paul II has a copy of the photograph, and it is being analyzed by investigators from the Vatican. Professor Valentín thought at first that someone, presumably the people at the photo lab, had created this startling image as a joke, so he took the copy to another lab to see if one of their experts could determine whether it was some kind of trick. Peter Valentín’s amazement grew as he listened to the words of the expert. The photo was authentic! A more rigorous and detailed study reached the same conclusion: The image had not been manipulated, and no trickery was involved. In fact the monitor screen indicating the moment of the patient’s death could be clearly seen in the image, corresponding with the instant in which the spirit was leaving the body. No one there saw anything; the soul is invisible to human eyes. Professor Valentín decided to consult with the clergyman at the hospital, a fairly lucid priest, and not one to waste time on trivialities. He immediately exclaimed, “Holy Heaven, it’s a human soul!” The priest insisted on revealing the news: for the first time, someone had managed to photograph a soul. Copies of the photo were sent to many religious centers throughout Europe, as well as to the greatest experts in the field. The response from the Church was immediate: Pope John Paul II asked for a copy of the photo, so that it could be studied at the Vatican laboratories. There is no official response yet from the Holy See, but they have received the photo and Roman experts are investigating. Their first impression is a positive one, as all signs indicate that this is not a trick, and that the photo is genuine: a human spirit leaving a body which has just passed away. Science Passes Judgment One expert on these matters who received the photograph is Dr. Frank Muller, a German scientist who dedicated himself to an exhaustive investigation of this most unusual picture. It’s the first time that an image of the human soul has been obtained. His conclusion is clear: this is the missing proof, the thing many people have been searching for since the beginning. According to Dr. Muller, people’s souls live eternally after leaving the physical body. As he sees it this is a confirmation of what it says in the Bible. This cannot be a trick, given that the best specialists have studied this photo for weeks with the greatest of interest, using the most sophisticated equipment. Dr. Muller knows that there will always be skeptical people who refuse to believe the evidence. But the skeptics don’t have a convincing alternate explanation, which accounts for the presence of the image on the paper. It’s an extreme case where, once again, the inexplicable plays an important role. There’s no room for any more studies; science has demonstrated that the photograph is authentic, without tricks of any kind. All that’s left is to stop thinking these things over, and to accept things as they are.